Lakeland Landscaping proudly announces the launch of our new website! The new website showcases our award-winning landscaping company, with over 42 years in Landscape Design and Installation, Hardscaping, Landscape Lighting, Outdoor Kitchens and Living Spaces, Landscape Maintenance, and Commercial Snow and Ice Management. The beautiful properties of many of our clients are portrayed throughout the website and in galleries of photographs displaying our workmanship and many of our NJLCA Award-Winning Designs. As one of the oldest landscaping companies in NJ, we felt it time to update our website to reflect the truly innovative and unique work we do. Many of our employees have been with us longer than most other landscapers have been in business. Our valued family of employees have received consistent commendations for the expert, conscientious, and diligent work ethic they employ with EVERY PROJECT, EVERY TIME. Sharing our heritage in the Landscaping Industry is of particular importance to the Skarbnik Family. From the raw determination and hard work of Dan Sr. to the continued commitment and hard work of Dan Jr., we know that our success stems from the relationships and the reputation we have earned. We know that the maintenance of your landscape is of equal importance as the distinctive reputation we have of excellence in all we do. Important new features of the site show our unique work and our accomplishments in the Landscaping Industry. Our “Before & After” and “Signature Gallery” photos show examples of our innovative designs for enhancing your outdoor living space and increasing your curb appeal with magnificent walkways, retaining walls, and lush gardens. 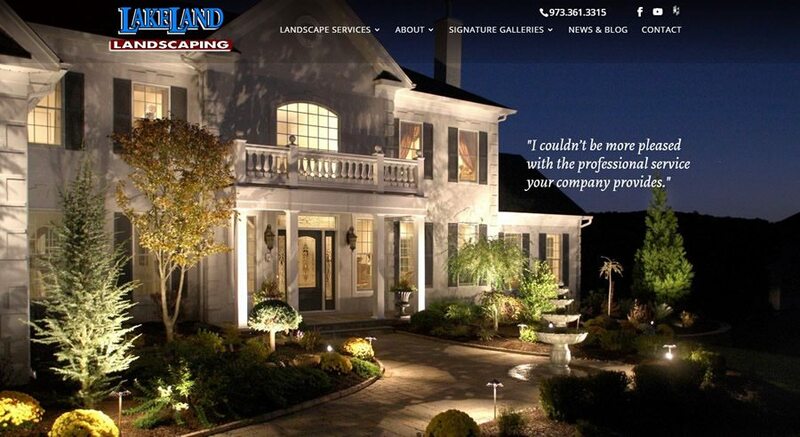 Lakeland Landscaping thanks the entire staff at Evans Alliance for the organization and coding of our new website. Evans Alliance’s talented Design and Development team have artfully portrayed our work to showcase its superior quality in Landscaping and Design. We invite you to view our work and hope to provide inspiration for your own landscaping project. Please keep us in mind for any landscaping services you may need.